Other websites of this company include SignalSteps.com (Lance Hunter), TensionTrader.com (Lance Hunter). LeapFX.com (Lance Hunter). 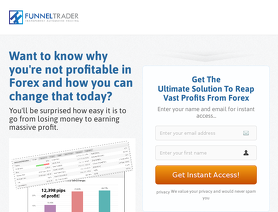 The FunnelTrader MT4 EA is a forex expert advisor. The Funnel Trader automated forex trading software for the MetaTrader platform had been forward tested on a live account by Forex Peace Army. The FunnelTrader.com forex robot places trades for you. Strong! Very good performance since I started. Yes, I get scared when I see the $1k+ draw down but the forex market always retraces. I use IC Markets because they allow free credit card deposit and withdrawal. That way I can deposit money when DD gets big and just refund my credit card before the bill even comes due. Never had a time when it went over the .13 lot size. Sep 18, 2016 - 5 Stars Now that I've had this robot for over a month, I still give it 5 stars as it has shown consistent profit for me. The only issue is my drawdown was over $1400 at one point. However, I was using the minimum amount account size for the settings which is 3000 to 30000. My one complaint is it does not work well with other robots on the same account. The consistency more than makes up for it though. I would love to see a hedging version. If it would open a separate basket of currencies in the opposite positions that would be interesting. I am concerned how long will a system like this remain profitable? I can't see robots remaining profitable forever. That's why it is soooo important to learn for yourself and not trust any robot to earn your income. I have finally found 3 robots I can count on for now but I believe I can only count on all 3 of them for a few years. Aug 22, 2016 - 5 Stars As I'm learning how to trade and before I make anymore trades myself on my real account, I searched for a robot to trade for me in the meantime that is profitable and I think i found the best one for the money (about $500). I've had this EA for over a week now and it's been trading as advertised and extremely great support. It's a fairly unique system that trades the same 5 pairs simultaneously, over and over profitably. It will buy 2 USD pairs and sell two other USD pairs that have a strong correlation to each other. The one pair that is not a usd pair is EUR/JPY but that tends to follow usd/JPY so those pairs are always bought or sold together. If you think about, it, that's a very good strategy even for manual trading. What makes the ea work well because if the market goes against you, the ea places another order at the support/resistance areas so it will then hopefully retrace and take profit. If that goes against you, then it will try again with a larger lot size. It goes up in lot size slowly as it does this. .01, .01, .02, .03, .05, etc (unless you change the default lot sizes). I like the fact that it is default to start with the smallest lot sizes because it makes it very conservative. If it fails, it will order the next round of 5 pairs at the bigger lot size but at that point, usually 3/5 of the first order is generally getting close to being profitable. When it becomes profitable overall, the ea then closes all trades, winning and losing, and starts over with 5 pairs of .01 lot size. I've read that this is martingale but I disagree. Martingale is when you double up on your last lot size to make up for the loss. Although the ea does go up in lot size, it is still using the original trades to make a profit. The way this ea trades, it does not make mathematical sense that it could ruin an account like martingale could. Doing the math with the 15 min chart, under semi extreme market conditions, it would go to a $200 drawdown at worst. With an even more extreme market like Brexit, it still did fine. I'm comfortable with that. I've used others that are much worse and destroyed my account on 2 trades (gps "eh hem" forex robot). The kicker for me was the fact that the seller Lance will give investor access to the account he has been running the system on since February. I look at it compared to mine and it's exactly the same trades. Since the ea trades until it's profitable, you will never have any losers. I looked back into Lance's history and the largest lot size I saw it had to go up to was .13. Very conservative and profitable. 3k+ profit in 6 months is great! This looks like it can be done with a $1000 account but he recommends $3000. I'm using $1500 and so far so good. Last week it went to .05 lot size once but all other trades closed out at the .03 level or less. I'd give more stars if i could. My only issue is if this continues to earn 10℅+ each month then it will make me lazy! Solid and consistent profits. Using this EA since beginning of July, profit has been created up to 12% in a 10k EUR account. No need to switch it off during high volatility events such as FEDs, NFPs etc. Five stars deserved.